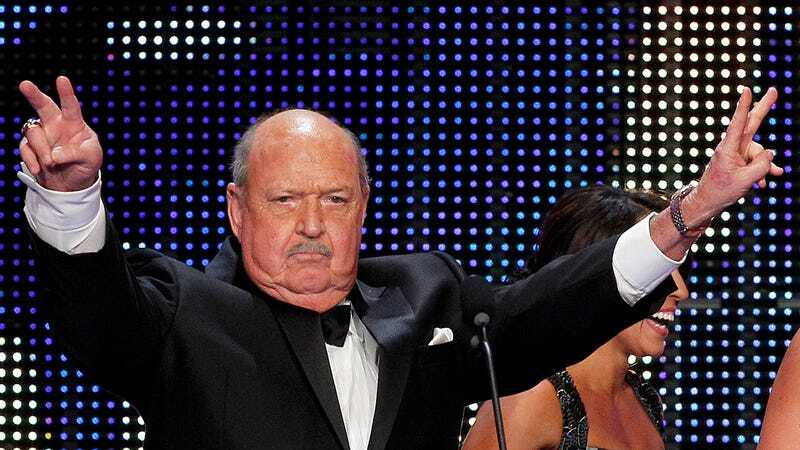 “Mean” Gene Okerlund at the WWE Hall of Fame induction ceremony in 2014. Longtime pro wrestling interviewer “Mean” Gene Okerlund died today, WWE announced. He was 76. WWE called Okerlund “the most recognizable interviewer in sports-entertainment history,” and for once that’s not an exaggeration. He had long stints in the American Wrestling Association, the World Wrestling Federation (later WWE) and World Championship Wrestling, and was the primary interviewer for WWF when it began the pro wrestling boom in the 1980s. He was with WCW during the Monday Night Wars. Okerlund studied broadcast journalism at the University of Nebraska, and eventually stumbled into wrestling with the AWA while working for a TV station. He eventually became their top interviewer before departing, like many of the wrestlers did, for the WWF in the early 1980s. It was in WWF where he made his role. When Okerlund interviewed a wrestler, it was real. It felt unscripted, even if it was. Okerlund played the role of sports announcer perfectly. He always kept a straight face as wrestlers shouted around him, occasionally spewing nonsense. It was a real performance, and he elevated it to something like art. He then joined another mass exodus to WCW in 1993, spending several years interviewing there. Surely it was not the highlight of his career, but he even wrestled a little! He beat Mark Madden. After leaving WCW in 2001, Okerlund returned to WWF/WWE and made sporadic appearances. Notably, he appeared in WWE Legends’ House along with other retired wrestling personalities. WWE did not release a cause of death.